Clear floral aqua notes of cyclamen with a pleasing scent of primrose will remind you of a fresh and gentle summer breeze. Ka-Fuh leads you to imagine sunlight filtering through the branches and leaves of a cool forest after a rain shower, as the mild scent of blossoms wafts softly in the air. 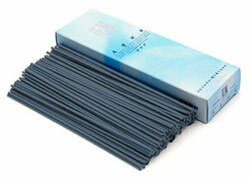 Ka-Fuh is made from selected natural organic ingredients by the incense craftsmen of Nippon Kodo.